At first glance, this 1923 photo in Abe Thompson’s scrapbook (1984ua004) may appear to record the funeral of a V.I.P. being given a military salute. It is, in fact, a mock funeral for Sewanee University, whose football team was beaten by the University of Kentucky 7-0 in a 1923 match. The tombstone reads “Here lies Sewanee – Died October [? ], 1923 – Chewed up by the Wildcats – Died a miserable death”. Mock funerals were a common prank in American colleges from the late 19th to early 20th centuries. In addition to “burying” opposing teams, students sometimes held funerals for their least favorite textbook, author, or class of the year. 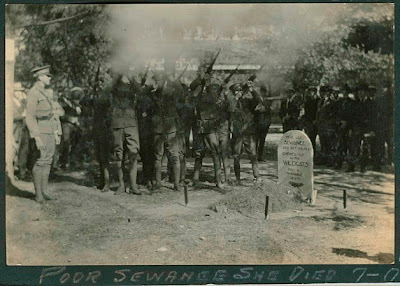 These were surprisingly complete with coffins, processions, dirges – and in the case of Sewanee’s funeral – military salutes. The more elaborate events were planned in advance by classes or social organizations and usually publicized in the form of flyers handed out to attendees the day of or before the “funeral”. The 1912 Kentuckian (U.K. yearbook) shows a funeral procession for Willis E. Smith, who is immortalized in illustration and verse as “a young fellow of excellent pith” who chooses to leave U.K. abruptly and finds himself the subject of speculation and frenzied searching by the University, who thinks that he has come to harm. Unfortunately, the context for this prank has been lost, so whoever “Willis E. Smith” was or represents has also been lost. While the tombstones for Sewanee and Willis E. Smith can no longer be seen on campus, the spirit in which the mock funerals were conducted lives on in student scrapbooks and yearbooks. 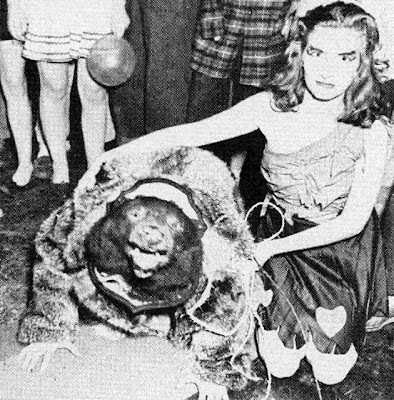 The Wolf Gal created a hullabaloo when she walked into the ballroom, complete with bear 'n everything. Molasses is a well-known product of the U.S. South, but in Kentucky and Tennessee the word more commonly refers to sorghum. There is a distinct difference between the two, even if the terms are used more or less interchangeably. Sorghum syrup is produced by crushing the stalks of the sorghum plant -- a type of grass – without removing any of the natural sugars. Molasses, on the other hand, is a by-product from the production of sugar from sugar cane or beets. Kentucky has a documented history of sorghum cultivation from as early as 1899 when 21,982 acres were grown and 1,277,206 gallons of syrup were produced. Production dropped steadily during the 20th century, until an increase in sugar prices in 1972. Since that time, sorghum production has steadily increased and the syrup is easily obtained throughout most of the state. Some varieties of sorghum are grown for fodder or grain (such as millet), but sorghum cultivation in Kentucky has always been primarily for production of syrup. The first step in this production is crushing the stalks in a sorghum mill. Although mechanized sorghum mills are now in use for most production, the original mills used horsepower of a different kind. Mills like the one pictured above would have been turned by a horse or mule tethered to the long wooden handle. The farmer would feed the stalks in through one hole, where they would be crushed by two steel cylinders. The resulting syrup would pour out through one spout, while the fibers would be extruded through another hole. 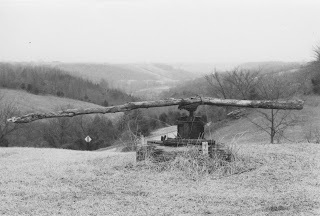 The mill pictured here is from a 1969 photograph from the Water Resources Study collection (2007ua034) in the University Archives, and was located in Spencer County, Kentucky. Even at this date, the mill appears to have been out of production for some time, but the field it stands in would once have been planted in sorghum. History (and sorghum) buffs can still see an antique sorghum mill in the model farm area of the Shaker Village at Pleasant Hill, Kentucky, and at sorghum festivals throughout the state in the fall. Frances Jewell McVey was born December 23, 1889 to Asa and Elizabeth Jewell in Harrison County, Kentucky. 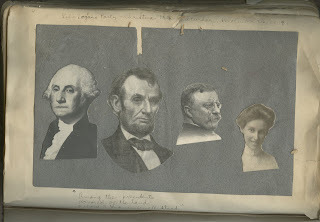 When she was a small child, the family (including brothers Robert and John) moved to Lexington, where Frances graduated from Sayre College before going to the Baldwin School in Bryn Mawr, Pennsylvania. She received her Bachelor of Arts from Vassar College in 1913 and a Master of Arts degree from Columbia University in 1918. She was awarded an honorary Doctor of Laws degree from the University of Kentucky in 1940. Frances Jewell McVey held several positions at the University of Kentucky, beginning as a professor in the English Department from 1915-1921, then as the Dean of Women from 1921-1923. In 1923, she married then President of UK, Frank LeRond McVey, and is perhaps best known for her role as the “First Lady of Maxwell Place.” The McVeys were the first President’s family to reside in Maxwell Place and Frances Jewell McVey was widely praised for her graciousness as host of many teas and dinners. Her interest in, and recipes for, traditional Kentucky and Southern foods were well known and publicized, as was her knowledge of gardening.